Upon leaving Thousand Trails Resort in Las Vegas, we decided to head north through Nevada and east into Utah. We talked about all of the National Parks in Utah, but decided to wait to visit them. Raymond was really looking forward to getting out of desert and geologic areas. So, we headed to Cedar City, Utah where we spent one night in a KOA Kampground. It was oddly situated. We were at the rear of the park and beyond the chain link fence with privacy slats, were town homes. It seemed peculiar to be right next to a residential area. We met a very nice guy who was working in the area and living at the campground. He shared lots of information about the whole state of Utah and advised Raymond to avoid buying beer in the state, "it's watered down," was what he shared. R had purchased beer at CVS before leaving Las Vegas, so he was glad he hadn't waited. We headed out in the morning, thinking we'd figure out our next stop along the way. We drove north on I-15 to Payson, where we got groceries, with our planned stop being the next exit, at Spanish Fork. We found some information online about a city park with RV accommodations that was ridiculously inexpensive, at only $12/night. It was called, Canyon View RV Park, and was basically, a parking lot with water and electric hook ups, and a dump station. There was a green zone behind each parking space which was lovely, treed, had a picnic bench and an incredible view of the mountains across the street. There was a path and also a flight of stairs giving access to Canyon View Park, which was located down the hill beyond the green spaces. It was a lovely city park, with a fishing pond, picnic areas, playground, shelters and a wonderful trail along the river. It was very nice! We stayed there four days and could've stayed longer, except that R was itching to move on. While facebooking about being in Spanish Fork, an internet friend whom I met years ago at a now defunct pet board, messaged me to say that Spanish Fork was only three hours from her and that Wyoming was certainly on the way to South Dakota, so I should plan on seeing her. I was thrilled! I-80 was the road we were traveling on through southwest Wyoming, and it would take us directly through her town! Since my friend works during the week, but has Fri/Sat/Sun off, we decided to head from Spanish Fork, through Green River, WY, where my friend lives, and out to Flaming Gorge National Recreation area, about 20 miles outside of town. 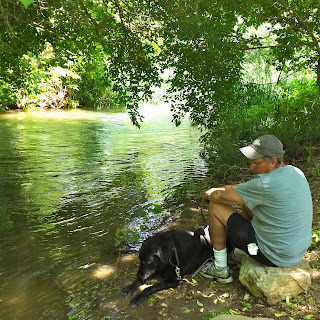 The plan was, to call Kandy, let her know we were at Flaming Gorge, but intended to come into a campground in town on Friday, to be available to meet up. I didn't count on the extremely inaccessible Verizon signal. Not only did we have no personal hotspot, we had no bars on the cell service. I couldn't communicate with Kandy by email, or phone. Add to that the frustration of having only electric hook ups and no showers and poor water. We expected to pay 50% of the posted rate for camping since we have our senior pass, but at this particular campsite, the discount applies first, then you get charged for electricity. All in all we were less than thrilled with the financial aspect and the public bathrooms. On the plus side, we saw lots of rabbits and antelope, and the area was beautiful and peaceful. Kandy tried calling us on Thursday evening and again Friday morning, but because I had no bars, I couldn't even listen to her message. Finally, I walked to the top of a hill, nearer the office and got enough of a signal to listen to messages and be able to place a spotty call to Kandy. We planned for me to call her again once we got into Green River and settled at the local campground. So, off we went to the campground formerly known as Tex's, in Green River, Wyoming. And I was going to finally meet up with someone I had known for several years, but only as a virtual friend. It was making me just a little nervous, but not for the reasons you might think. I knew that Kandy was an extremely intelligent woman with strong opinions and a kind heart. I was nervous because I was afraid she would find me boring, and old and fat and ugly. What the heck? Why do I revert to a freaked out teenager when it comes time to meet people? For heaven's sake, I'm 62! I really need to overcome this social anxiety, already! I'll tell the rest in the next installment.